She speaks with the enthusiasm and pace that allowed her to give movement to the creatures that she animated for Disney. But that belies the patience needed to sculpt her art in stone. Ellen Woodbury describes stone sculpting as similar to playing chess — one has to think a couple of moves ahead. 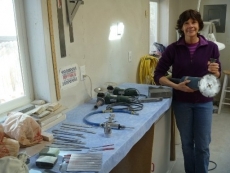 Ellen Woodbury displays some of the tools she uses to create her stone sculptures. She is an “Ellen-come-lately” to the world of sculpture. After growing up in northern New York state where she attended the College of Visual and Performing Arts at Syracuse University. She earned a bachelor in fine arts in film and art after exploring an early major in Environmental Science and Languages. Languages fascinated her, and then she took an art class and the world looked different to her. From New York to California and the California Institute of the Arts where she earned her masters in fine art in experimental animation. The films she made as a student earned national and international recognition. A next logical step was to the Disney Studios. That wasn’t an easy step but after finally having the films she left reviewed she began as an assistant in animation, basically doing “cleanup” on others’ work. She pursued that avenue until she became an animation assistant and from that to scenes of her own to animate. Ellen became directing animator for Zazu, the sassy hornbird, in “The Lion King“. Her progression was from birds to horses to flying horses to aliens as she assumed more responsibility with Disney. For her, “learning the computer was like discovering the lost world.” And she mastered its usage as she designed a training program and performed computer animation for five years. During her time at Disney she took drawing classes during her lunch break which led her into working with wax and clay. Then she came to a sculpture show in Loveland in 2004. She said she was “stunned” at the works displayed and inspired to do more sculpting in clay. The next year she returned to the Sculpture Invitational and bought a house to finalize her career change. A session at 10,000 feet at the Marble Symposium in Marble, during which she spent 10 days with a fabulous instructor, confirmed her motivation to work in stone. Stone is tricky; you learn by doing as you go. Stone takes patience and creative problem solving as different stones possess different characteristics. The tools required are many, both powered and hand-driven. The collection seems to resemble a dentist’s tool kit for a dinosaur. Ellen’s creations are all one-of-a kind animals with a stylized appearance due to her use of triangles and spirals. She coaxes the animals out of large blocks of stones, many of which offer different colors and shades within the same chunk of stone. Her animals beckon the viewer to look and then look again as her background in animation makes them virtually seem to emerge from the sculpture. “Nature’s Paradox,” her take on a platypus, leads the observer to almost believe he’s looking into an Australian pond (which is just the effect she seeks). Stone to Ellen is another opportunity to create another animal worthy of the Magic Kingdom where she honed her craft.